I met Candice when she was doing my makeup for my little sister's wedding, and she blew me away. She's a powerful combination of warmth, strength, candor and hustle. Whether she's removing tattoos with the only organic product on the market, launching a new skin care brand, or loving her son through a health challenge, she's fully present, creative and unstoppable. 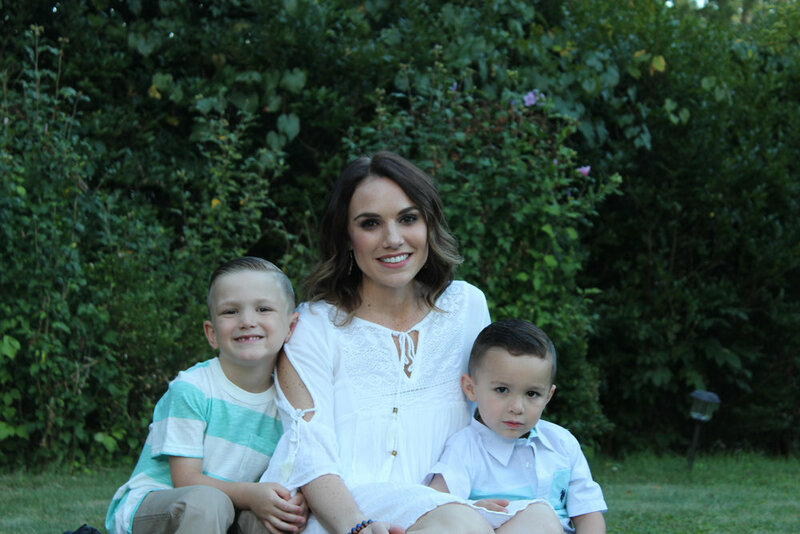 Read more about her motherhood story below, and check out her services and incredible organic skin care products here. What was the biggest surprise to you when you became a mom for the first time? The biggest surprise was learning how strong I could be on my own. When I had my first child I was a single mom who'd experienced four pregnancy losses and a failed marriage. I was living in Mexico by myself. I had no family or friends to rely on. Just my son, Luca and me. I am a happier person and better mother when I am accomplishing something outside of the home. I have major respect for full time mothers because I am not able to be my best self without working outside the home. Full time motherhood is so hard. My business is my second baby, and I enjoy nurturing that too. Did you plan to breastfeed your baby? How did it go? Better or worse than expected? Yes, I did plan to breastfeed. I was not able to with my first son but I managed it for almost a year with my second son, Giovanni. Now pregnant with my third, I do plan on breastfeeding this baby as well. What were your expectations going into nursing your baby, if you had any? I honestly did not know what to expect. I just wanted to breast feed him for as long as I possibly could. If you lost a pregnancy and want to share your story, we would be grateful to hear from you in order to support other women going through the same thing. I actually lost four babies. Four in a row. I was treated at Magee Women's Hospital with the director of Maternal Fetal Medicine, and they could not understand why I had such an easy time getting pregnant but I could not hold the pregnancy. I have a theory: I was with the wrong man. After seem things happened that I could not forgive, my marriage ended, though I had a child with my first husband via gestational surrogacy. I was a single mother in Mexico when I met my current husband. Three months after my first son was born, I found out I was pregnant with my second son. It happened effortlessly with my current husband Aaron. I had no blood clots, no issues, and I carried our son for so long that I had to be induced. Now I am pregnant with my third baby. So far so good. I will keep you posted. Was your partner supportive of your decision to go back to work or stay home with baby? What did that decision look like for you? My husband, Aaron is one of the most selfless people I know. I truly believe he was sent from God because this man saves my life every day. He is my biggest cheerleader. I have taken 10 advanced classes since becoming a mother. These classes are sometimes out of state for a week long. Never once has he tried to stop me. Instead he helps me to book my flights and tells me how proud he is of me. Aaron knows that I struggle with depression and anxiety. I need to be building, dreaming, achieving. Because I am a business owner I do have a flexibility that allows me create my own schedule as well as be there for my children when they are sick. Did you decide to hire support after giving birth, e.g. baby nurse, nanny, housekeeper? We are very fortunate to have the help of family as well as daycare for our children. What do you miss most about your life before becoming a mother? I miss showering when I want...alone, ha! And sleep. Restful sleep! What has been the best thing you've given up since becoming a mother? The best thing I have given up since becoming a mother is fake friends. I have meaningful relationships now and I am very grateful for my tribe.